Phasing: Circuitry in the Ghost’s suit allows him to become intangible by putting his body slightly out of phase with this dimension. These circuits cannot operate at the same time as the suit’s invisibility circuits do. 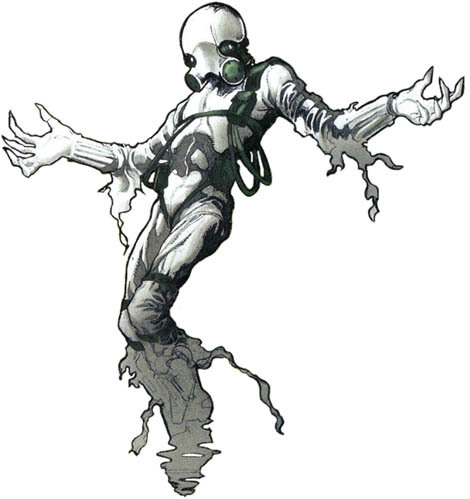 Invisibility: Certain circuits in his suit allow the Ghost to become invisible at will. The Ghost can also turn objects invisible as long as he remains in contact with them. The circuits can also render him invisible to most mechanical and electronic sensors. Computer Control: Circuits in the Ghost’s suit allow him to control and reprogram computers by touching the equipment. Weapons: The Ghost carries weapons such as grenades, napalm grenades, and handguns that fire energy beams. He also carries portable versions of his intangibility circuits that he can attach to people or objects.